To most, the aphid is an irritating pest, but there is much more going on than meets the eye. As you all know, in the butterfly house all of our plants are pesticide free, therefore we have a MAJOR aphid infestation that we battle every year. While fighting the good fight, we have witnessed some of the amazing habits and relationships that aphids have with Ants. Aphids are known as a pest species because they feed on the sap within leaves, which greatly weakens the plant. They are also vectors for plant diseases and parasites which can lead to plant death. The excrement produced by aphids is called honeydew, when deposited on plant leaves, it turns black and molds over time, maiming or killing the plant. This honeydew, is a sugary substance that is coveted by many insect species. In fact, some species of ants will farm and protect aphid populations. The ants form a symbiotic relationship with the aphids, protecting the aphids from their predators (our beneficial insects) such as green lacewings, ladybugs, parasitic wasps and spiders. 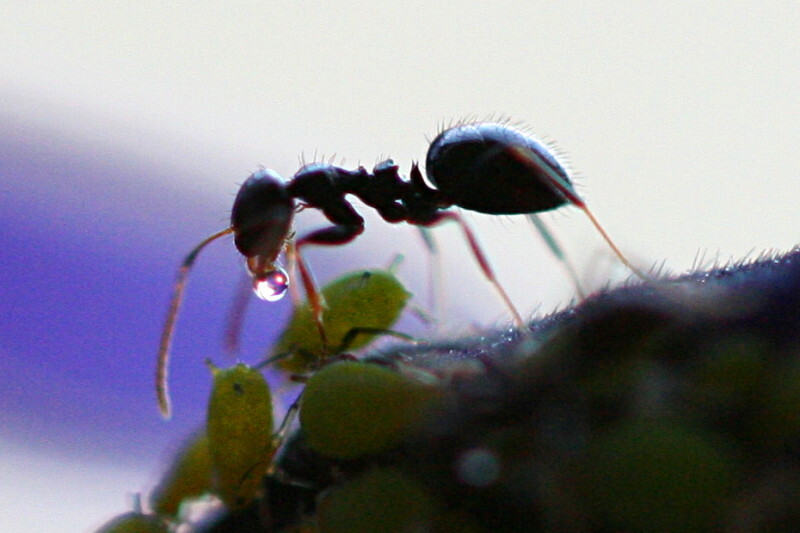 In return, the ants are given ‘farming rights’ and literally milk the aphids. The ants will stroke the abdomen of the aphids, prompting them to expel the sugary treat. See the image below, our farmer is happily reaping the benefits of hard work. This mutually beneficial relationship even extends over multiple generations! Ants have been known to store aphid eggs in their nests over the winter, then in spring, they carry the newly hatched aphids back up to the new leaf growth, for their first feeding. As amazing as this relationship is, us gardeners are no fan of aphids. So some ways to manage their population, without hurting our beneficial pollinators, is to spray the infected plants with soapy water. In the past, we have used dawn soap, maybe a teaspoon or two to a spray bottle full of water (I usually do a good squeeze or two of the soap bottle). Give it a shake and spray the plants every 2 to 3 days. This year we switched things up a bit, and used Dr. Bronner’s Peppermint Soap. It has been working extremely well! Peppermint is also a natural repellent for spiders, mealy bugs, and ants, so it’s a double whammy! Happy gardening!